Prudential is a British financial services company. They used the Psion II with a pack containing custom software for helping to sell their products. The software can be found on the Pack Images page. All rights reserved. This document and the programs referred to herein are copyright works of PSION PLC, London, England. Reproduction in whole or in part including utilisation in machines capable of reproduction or retrieval, without the express permission of PSION PLC, is prohibited. Reverse engineering is also prohibited. PSION and the PSION logo are registered trademarks of PSION PLC. PSION Organiser II, Datapak and Rampak are trademarks of PSION PLC. This document should be treated as confidential, for the eyes of Prudential employees only. Please ensure that this requirement is respected and observed. With the arrival of your PSION Organiser you are ready to embark on a whole new way of selling. The PSION's many functions will help you show clients the benefits of Prudential products more quickly, more effectively and more professionally. With just a few minutes practice I'm sure you'll find the programs quick, simple and even enjoyable to use I'm equally confident that it won't take you long to make the most of the benefits the PSION offers you and your clients. 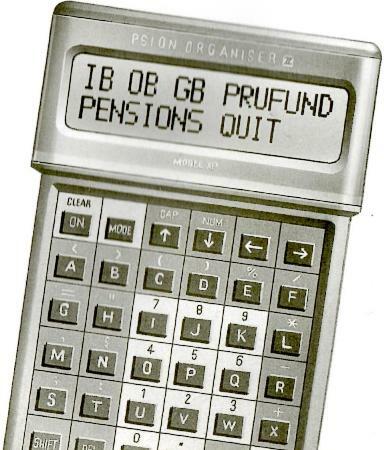 The PSION Organiser has been made available to fulfill two functions, one to be used as an Organiser and two to calculate premiums and benefits using specially written programs. We think you will find it quick and easy to use, helping to make your presentations to your clients more professional by using modern technology. You can, if you want, let the clients see various screens that demonstrate how certain aspects of the Prudential Products will benefit them whether it is the sum assured, the illustrated maturity value, the lump sum in a pension or the cover we can offer on our Personal Line Products. Selling the PSION way is a whole new way of demonstrating the many ways in which the Client can benefit from the range of Prudential Products. The PSION has a keyboard with 56 keys and a 2 line screen display which shows up to 32 characters. Press the ON/CLEAR key (1). Press any of the four arrows (2). Press the key corresponding to the first letter of the option e.g. F for FIND (3). the EXE or enter key. When using other options on the PSION refer to the PSION Operating Manual section 2-2 for information on using the keyboard. To get back to the main menu from any of the table selection screens press the ON/CLEAR key until the main menu appears. If you are already working through a quotation and wish to return to the main menu press the MODE key and select the EXIT option. To switch off the PSION return to the Main Menu. Press O. To conserve battery power the PSION will switch off if no keys are depressed for more than 5 minutes - no loss of information will occur. Pressing, ON/CLEAR will return you to your last screen. For further information on the standard PSION options refer to the relevant section of the PSION Operating Manual. For the more adventurous to write their own programs. You must not, of course, write your own quotation programs! (See page 11-1). The PSION is powered by one 9 volt PP5 size battery, it is best to use alkaline batteries as they last longer. When the battery runs low, a "BATTERY LOW" message will be displayed on the screen, and the machine will switch itself off. The battery must be replaced before you can use the machine again, but DON'T remove the old battery until you have a new one ready. Information stored in the internal memory of the PSION relies on the presence of a battery to keep it safe. IF THE NEW BATTERY IS NOT INSERTED WITHIN 90 SECONDS OF REMOVING THE OLD ONE, ALL INFORMATION STORED IN THE INTERNAL MEMORY WILL BE LOST. (The information held on Datapaks is safe and will not he lost). THE PSION MUST BE SWITCHED OFF AND THE 'ON/CLEAR' KEY MUST NOT BE DEPRESSED WHEN REPLACING THE BATTERY. Insert the new battery, making sure that the two contacts on top of the battery slide all the way into the battery connector. Note that the + contact goes in first. Replace the battery cover by clipping it into place. The PSION has its own internal memory for storing information, for example when you are using the Diary option, this is called Device A. There are also two external devices in the back of the PSION which are fitted with covers to protect the connections These are device B, which is nearest the top, and device C.
Both external devices can hold a small memory unit called a Datapak. These can be either blank, for storing your own information on, or pre-programmed, to give you extra functions such as quotes. You are provided with a pre-programmed Quotes Datapak which enables you to calculate new business quotations on your PSION. You should avoid pressing any keys while fitting or removing a Datapak. Place the PSION face down on a flat surface and remove the sliding protective cover over device B or C, by pressing down and out on the ribbed portion of the cover. The new Datapak can then be fitted by sliding it into the space until it clicks into place. Press the ON/CLEAR key twice (which will turn the machine on and enter the quotes option on to your screen). You can remove the Datapak by pressing down and out on the ribbed section and sliding it out. When using your PSION you should always have a datapak or a protective cover on each of the devices B and C.
Datapaks are not affected when the battery runs low, the information on them is secure. To enable you to provide accurate quotes an updated Datapak will be provided for your PSION whenever any changes are made to the premium rates. They will he sent to you via your District Office. With the machine turned off, you should remove the old Datapak and insert the new one in the same device and press ON/CLEAR. The old Datapak must be returned to your District Office as soon as possible, so it can be sent back and prepared for reprogramming. Now that we have looked at the technical introduction to the PSION and learnt how to switch it on and off etc, let us look at what the PSION does product by product. In the following pages you will see examples of how, step by step, the PSION is used to produce a quotation for some of our products. In each product example you will see that a case study is used to show you how the relevant client information is input and, most importantly, the details of the quotation for you to use visually in your product presentation to the client. As the client information is input you can check through the detail on each screen and gain the client agreement that this information is correct. You may find it useful to involve the client in the calculation process - agreement on small pieces of information can make the client's final agreement more forthcoming. Whenever possible you should use the Needs Analysis which will illustrate the client need and the size of that need. By showing the client the full extent of the need, premiums can easily be justified - after all you have only acted on the information given by that client. You may, however, need to negotiate either upwards or downwards. Remember, if you have any queries there is help at hand by checking with your colleagues, your Manager or telephoning the Field Technology Help Desk, on 0800 282462 or 071 334 6600. So let us look at some product examples now. As a result of completing a Personal Financial Review, a male client, aged 40 next birthday, who smokes cigarettes, has a need for lifetime assurance. He works as a warehouseman in a local factory and is paid weekly. He would prefer to pay the premiums four weekly in cash, and can afford £4 per week. He asks you to produce a quotation. From the Personal Financial Review and using the decision trees, this client needs are best met by a lifetime assurance plan, Table M, paying a four weekly premium of £16. Your Psion Organiser will allow you to give an accurate and quick quotation of the sum assured for this client for such a lifetime assurance plan. Work through this example, using the notes on this page and compare your screen with the displays shown on the opposite page. Step 1 QUOTES FIND SAVE DIARY CALC PROG Step 1 This is the PSION main menu screen. To select an option use either the ↑ ↓ ← → keys, then press EXE or enter the first letter of your required option. For our example select Q for QUOTES. Select I for Industrial Branch (IB) for this exercise. This screen is the IB 'menu' which allows you to select any of the IB plans. The case study requires Table M so, as above, use the arrow keys followed by EXE or the letter M to obtain a Table M quotation. This screen allows you to check that you have selected the correct product for the quotation before proceeding. Press EXE to accept this. This screen appears after the product description and expects you to supply client details. Select 'Y' for Male Life. Now press 4 and 0 (zero) for the age next birthday and press EXE. Our client is a smoker, so press 'Y' to input this information. This screen is asking for more information. Key in 16 for the amount of the 4 weekly premium and press EXE. This screen is telling you that the PSION is validating your information. Here is the term and assured quotation for your client. Use this and the following screens to complete a quotation form. This screen tells you what information will be given next. This screen shows the illustration of the total amount payable to the client if he were to die 10 years after the commencement date at an assumed rate of investment return of 10.5% p.a. Press EXE to continue. This screen shows the illustration of the total amount payable to the client if he were to die 10 years after the commencement date at an assumed rate of investment return of 7.0% p.a. Press EXE to continue. This screen completes this client's quotation for a Lifetime Assurance Plan, Table M. Press EXE. You can now present the information on the quotation form to your client. The last screen asks if you want another quotation as you may wish to show your client figures based on another 4 weekly premium, or a quotation for his wife. If you have completed this exercise successfully, well done! Go to the next. If you experienced any difficulties or problems, try the exercise again to familiarise yourself with obtaining a PSION quotation. As a result of completing a Personal Financial Review on a married couple, both aged 45 next birthday, who do not smoke, you will find they have a need for long term savings with some life cover. Using the decision trees the clients agree that the best advice is a Joint Life Endowment Savings Plan as they do not like the idea of a unit-linked plan. You suggested a sum assured of £20,000 and a Joint Life Endowment Savings Plan was agreed on. From the main menu use the arrow keys to move the cursor to O and EXE or the initial letter O and EXE to select OB. This is the Ordinary Branch 'menu' and OB products are divided into OB life or Low Cost Endowments. Select O for OB life. This screen is asking whether you want a quotation for a single life or joint lives. By pressing N you are selecting a joint life plan. This screen asks whether you require a quotation based on the premium to be paid or the sum assured required. For these clients we know the sum assured so select S.
This is an information screen, telling you that on the following screen you will need to enter the Ordinary Branch Table for which you require a quotation. Press EXE. Select the Table you require from those listed here by moving the cursor to the first number or letter and press EXE, i.e. 1 for 19A then EXE. This screen shows that you have selected the Endowment Savings Joint Life With Profits Plan. Press EXE. Enter your client information on this screen by pressing Y for Male life. Press 4 and 5 followed by EXE for the age of the client. The following screens are the same as for Male life. Enter Y for Female life. This screen requires information about the proposed term of the plan, which is for 20 years. Press 2 and 0 followed by EXE. If you selected correctly at screen 4 that you required a quotation based on the sum assured, screen twelve will ask you what sum assured is required. Press 20000 and EXE. Psion will now proceed to produce the quotation based upon the information you have entered. This screen tells you that the next screens will give you the illustrated maturity amount. Press EXE. Complete the amount shown here on the quotation form for these clients and press EXE. The amount shown here should also be shown on the form. Then press EXE. Show the premium on the quotation form and use all the information for the sales presentation to the clients. If required further quotations for the same product and client can be obtained by selecting Y. You have now had a brief explanation of how to start using the PSION, and how to look after it. You have also been through a couple of case studies where we have shown a step by step look at the screens, what they mean and how to advance to the next step in the quotation. If you have any difficulties or anything unusual happens whilst you are using it you should find the answer in the comprehensive user manual. If you are unable to solve the problem then telephone the Help Desk. Please give your name, agency number and details of the problem. Remember the more information you give the quicker the Help Desk will be able to solve it.